12 volt, 5 batteries charged by: engine, wind generator, solar panels, shore power 800w inverter. Traditional layout with original 'Leatherette' upholstery. 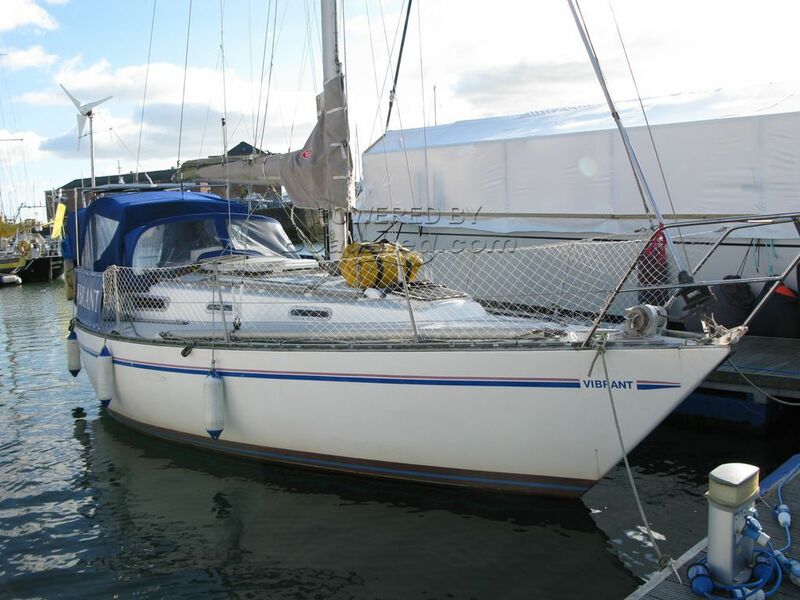 The Sadler 32 was launched as a modernised successor to the fantastic Contessa 32. Not everyone, especially in the racing world, thought it a big improvement but, she is a thoroughly robust and well constructed open water cruiser that will look after her crew when the weather turns foul. The Sadler is still very much a cruiser racer, but the emphasis here is more on the cruiser, as might be deduced from the wide screen TV, multiple solar chargers and the extended battery bank; not to mention the rather nice full cockpit camper cover for marina living! I would suggest that she is keenly priced to reflect her age, rather than her condition, which I would consider good for her age. This Sadler 32 has been personally photographed and viewed by Alan Coy of Boatshed Wales. Click here for contact details.